Home Uncategorized Milk bar! The evolution of the Candy Bar! Milk bar! The evolution of the Candy Bar! I discovered this over on the site Always a Blogsmaid. Check it out! Its a great blog to follow. I really think this is wonderful. 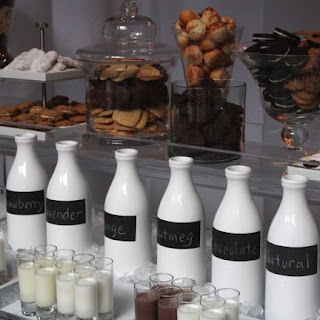 A splendid idea to go with a cookie/candy bar! So clever and sleek and fun. I cannot wait to show this and suggest it to some of my upcoming brides. Nothing says comfort quite like cookies and milk. And these are very grown up milk choices. I’ll take one of each, please! Send flowers to your valentine, early and often!